This extravagent 14ct Strawberry Gold ring features a rectangular cut Peach Morganite stone surrounded by delectable Chocolate Diamonds. This ring is the epitome of lavish jewellery. Matching band: 1785397. 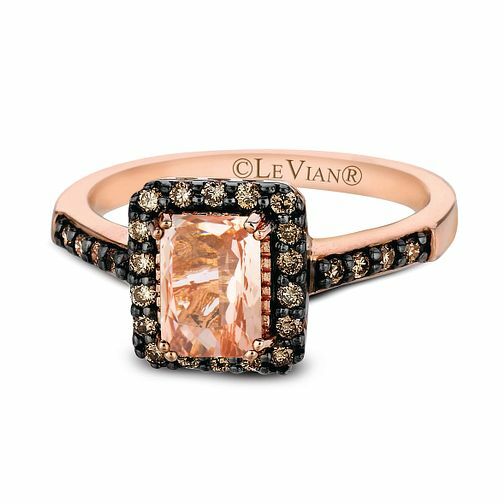 Le Vian 14ct Strawberry Gold and Peach Morganite ring is rated 4.8 out of 5 by 4. Rated 5 out of 5 by Anonymous from Beautiful unusual ring This ring looks better in real life. It looks beautiful and sparkles brilliantly. Strawberry gold is perfect for the Morganite which is a really subtle peach colour. I love this ring and have received many compliments. Have the matching earrings and they are also stunning.